Due to personal circumstances I am unable to lead either retreats or seminars this year. Find out more about my books, and how to purchase them. Feel free to get in touch with me if you would like to learn more. 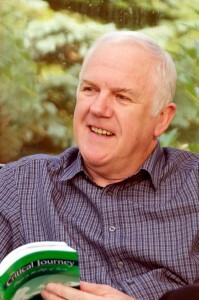 Charis Training reflects the teaching and training ministry of Tony Horsfall. Tony is married to Evelyn, and they have two grown-up children. They live in Cudworth, near the town of Barnsley in Yorkshire, England. Tony Became a Christian at the age of 14, being converted in the Methodist Chapel in the village where he grew up in Yorkshire, England. After studying at London Bible College, where he graduated with a BD (Hons), he completed his teacher training at Carnegie College in Leeds (CertEd). After a short spell of teaching, Tony & Evelyn joined the Overseas Missionary Fellowship, and worked in a church planting ministry in Sarawak, Malaysia (1975-83). They returned to England and Tony pastored a church in West Yorkshire until 1993, when he became a full-time trainer with EQUIP, a missions training programme based at Bawtry Hall near Doncaster. In 2000 Tony began to explore contemplative spirituality, seeking to integrate its insights into the evangelical and charismatic framework. Convinced of the importance of intimacy with God as the foundation of all effective ministry, he moved into a freelance ministry in 2002, with the intention of helping others to experience the grace of God in their lives and to be drawn into a closer fellowship with Him. Tony has been involved in the leadership of Ackworth Community Church for over 20 years. He regularly travels to Singapore and Malaysia to share the message of grace and intimacy with missionaries and church leaders. For several years he served as Pastoral Carer for Mission Aviation Fellowship, regularly visiting their teams in seven African countries. It is the aim of Charis Training to enable individuals (an especially those in full-time Christian ministry) to experience the wonderful grace of God in a personal way, and as a result begin to enjoy the kind of intimacy with God that is promised to us in the Bible, and which leads to a fruitful and effective life. Tony is available to come and share with your church or organisation, and the following pages give an indication of the kind of topics he loves to teach. Please note that he does not himself organise training events.